A new MCPER publication is featured in the March 2018 newsletter of the U.S. Department of Education's Office of Special Education Programs (OSEP). 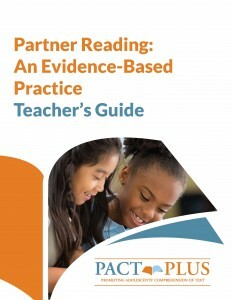 "Partner Reading: An Evidence-Based Practice – Teacher's Guide" was developed by MCPER's PACT Plus project. The guide provides teachers with a feasible procedure for partner reading—a research-based instructional routine incorporating peer modeling into reading—that can be used in middle school classrooms. The guide features an explanation of the research on partner reading; an overview of the routine, including setting up the classroom, modeling the procedure, and selecting and preparing a text; and two lesson plans and materials. The monthly OSEP newsletter "provides stakeholder resources and timely news related to OSEP and the Individuals with Disabilities Education Act [and] highlights information that affects ... state and discretionary grantees, families, educators, practitioners, administrators, researchers, and more," according to OSEP. To subscribe to the newsletter, visit the OSEP website.